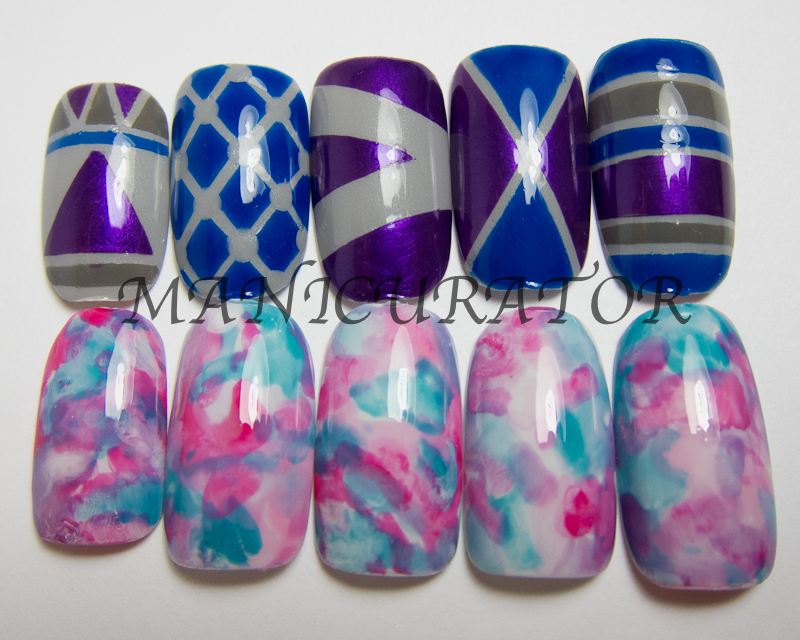 I wanted to create a look with sharp, clean lines and a geometric feel for one of the sets. I knew I wanted a very different look for the second set. 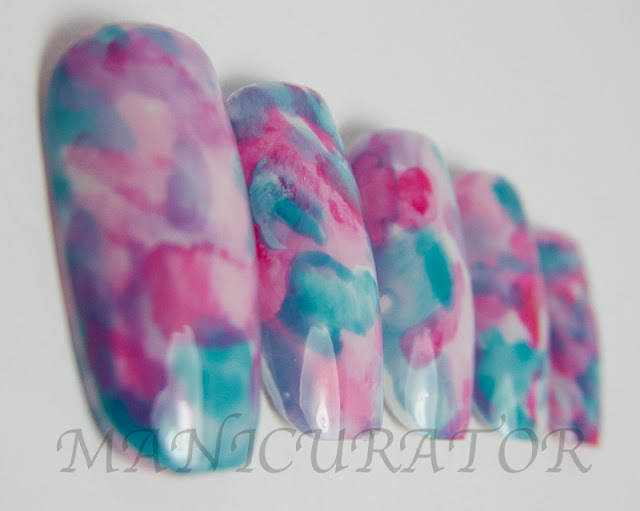 I created this "watercolor" look to give a soft, artsy, almost ethereal feel. 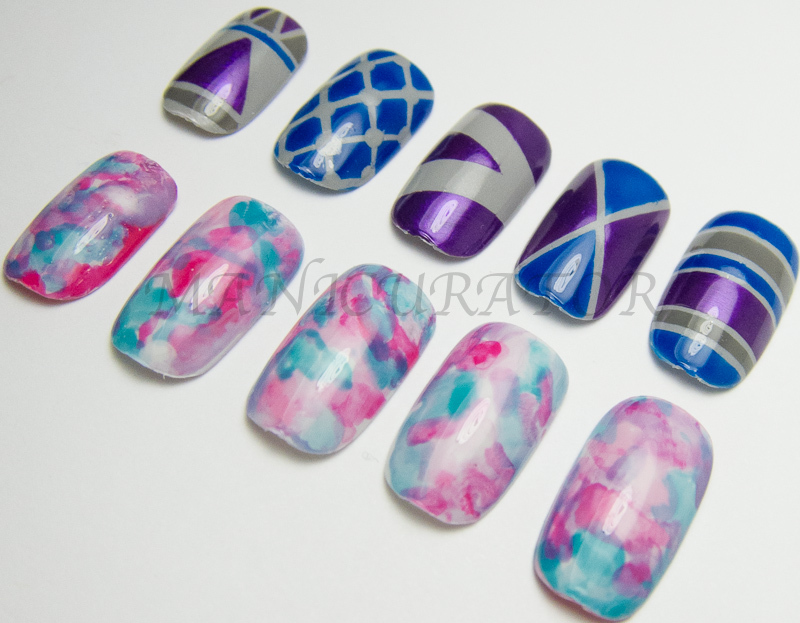 This was my first time working on fake nails, which presented its own challenges. I found it difficult to get them all shaped exactly the way I wanted them. And a challenge to get them photographed the way I wanted as I could, obviously, not just move them around to catch the light the way I can with my own hand. I am very pleased with how these turned out and they represent exactly what I was going for! I am super proud to be included in this project! 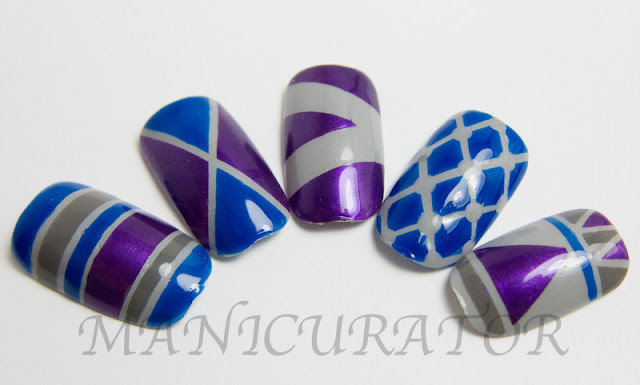 For the geometric set, I started with a base of 2 coats of China Glaze Pelican Gray. 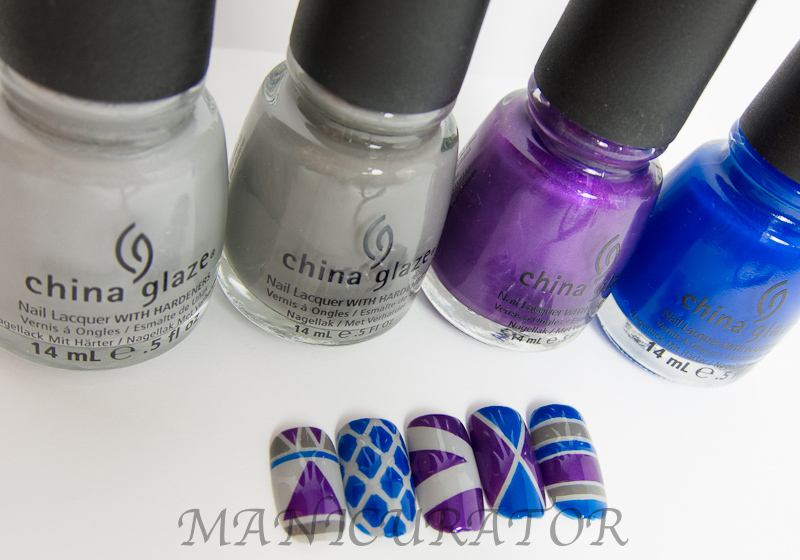 Once dry I placed striping tape to block off certain areas, and filled in with the other 3 China Glaze colors. 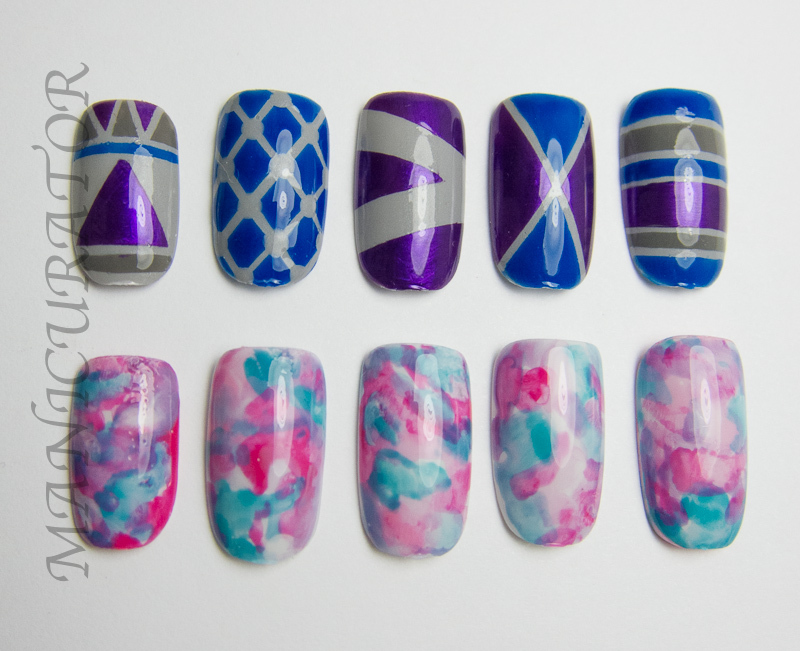 I actually sketched out (on paper) what patterns I wanted and which colors to use. I did one nail at a time so I would be able to pull off the tape as soon as possible. If you let the polish sit on the nail too long, it gets harder to pull off the tape with a clean line. 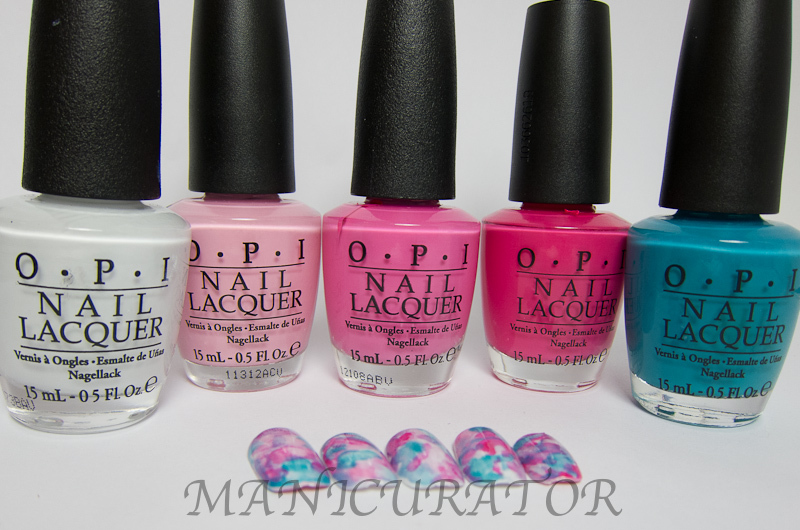 The watercolor set, started with a base of 2 coats of OPI My Boyfriend Scales Walls. 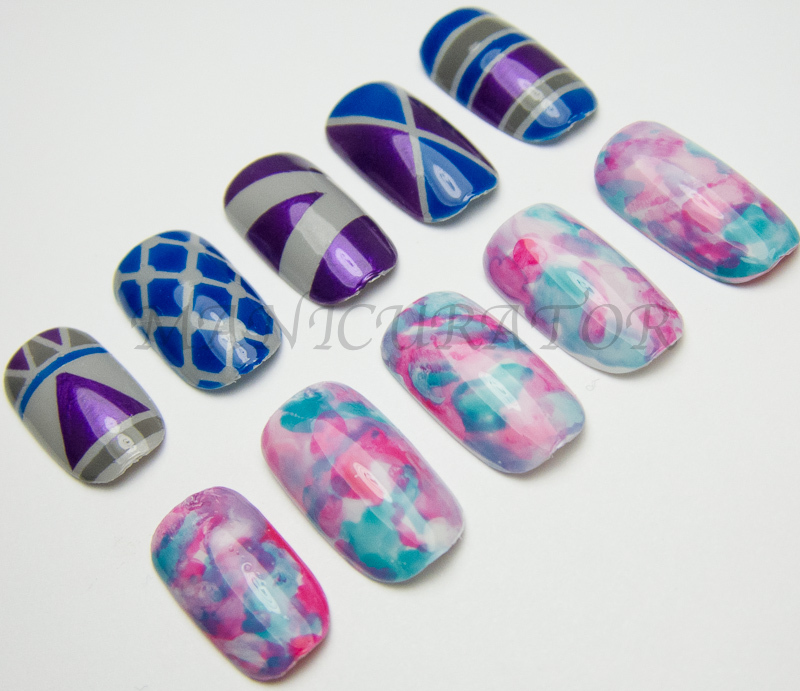 Then I coated with a normal (not fast dry) top coat and waited a while for it to dry. Then I made little "puddles" of each OPI color on a plastic bag and filled a cap full of acetone. I used a small paintbrush, dipped into a polish color, then into the acetone and well..painted! I found if you do it this way...instead of painting the polish directly onto the nail and then putting acetone directly onto the nail...it makes it easier to get the polish where I want and how I want. i love both of these but that geometric one is my favorite! i love all the colors you used too. they are just stunning, what else can I say?! These are beautiful- the watercolor ones are my favorite. 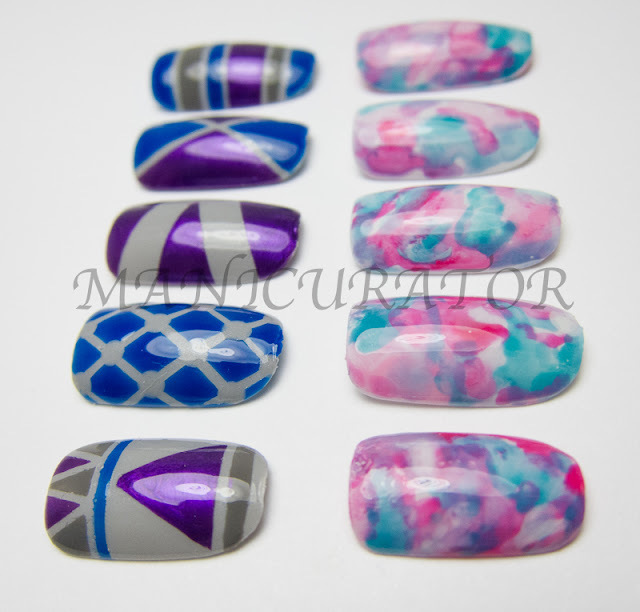 Love the geometric print one! Not that I would wear it, but its so fun! Plus I need Pelican gray. Its official, I need a CG haul. 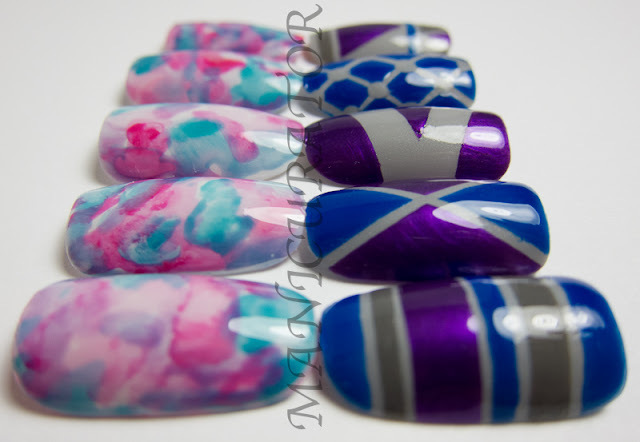 These are gorg! You didn't glue then anything? How did you work with these nails they way they are? 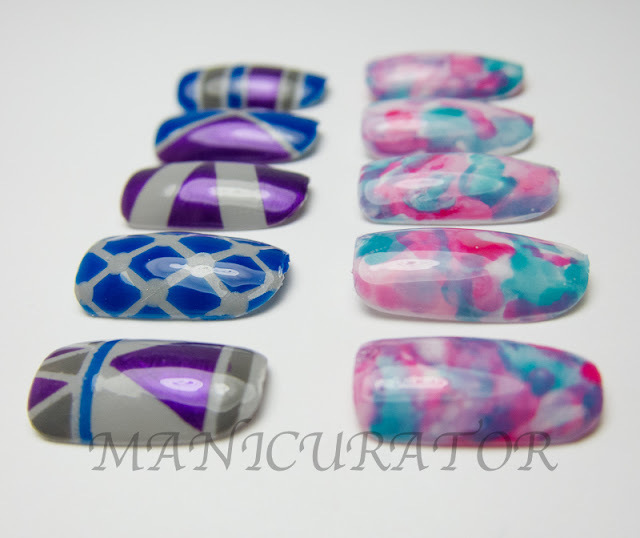 How did you do that stunning blue geometric nail? striping tape and then a dotting tool?